Scoop approximately 2 5/8 tbs. of cookie batter, yogurt, and other soft foods using this red, 1.33 oz. #24 disher. Its color-coded handle makes capacity classification and portion control a breeze when serving hot or cold foods in your restaurant, cafeteria, or bakery! In addition to the at-a-glance serving size identification, the sizes are also stamped on the bowl knife blade so you always know exactly which tool you're grabbing. 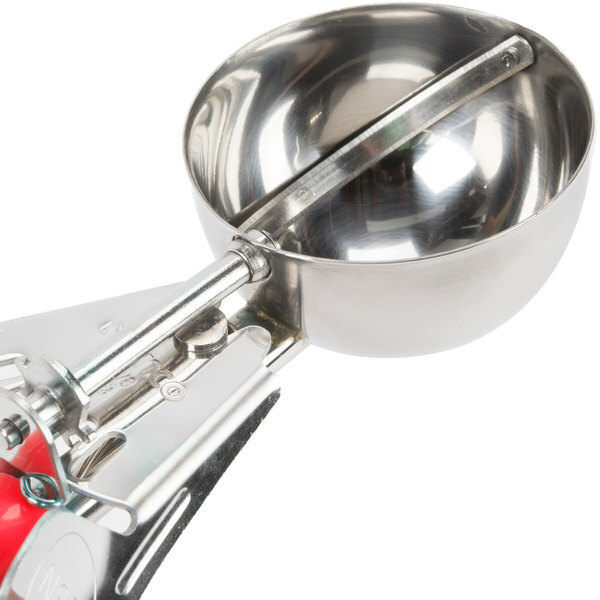 The two-piece thumb lever is designed for simple, right-handed operation and combines with the quick release to ensure that the bowl is scraped clean, reducing waste and maximizing your yield. Perfect for use in a high volume environment, this disher is constructed of stainless steel with all metal parts for added durability and cleanability. 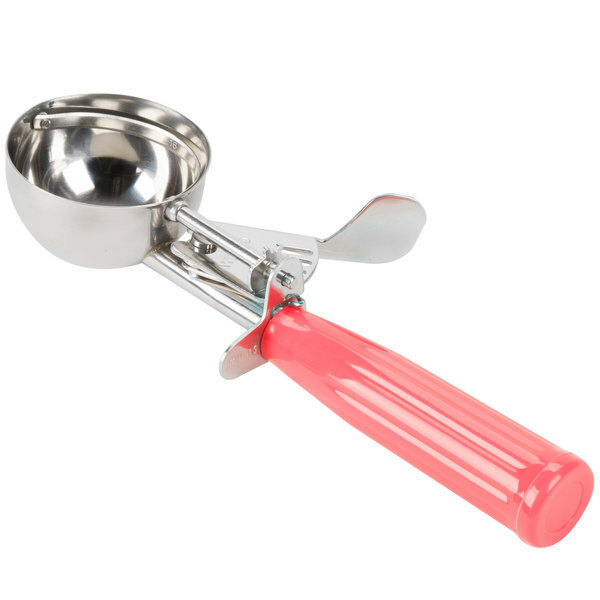 #24 Round Squeeze Handle Disher Portion Scoop - 1.75 oz. I bought this scoop to scoop cupcake batter into my pans, this size is perfect. I gave 4 stars because the handles aren't as high of a quality as you would expect, it's just thin hollow plastic. Other than that I love the price and it does the job. GREAT FOR MY MEATBALLS AND PERFECT SIZE FOR ME TO MAKE MY BBQ SUNDAE AND HAVE TO SCOOP THE MEAT GREAT FOR EQUAL MEASUREMENTS FOR ALL AND KEEP EVERYTHING EQUAL. These fishers are a great addition to my bakery! They can be used for many things. 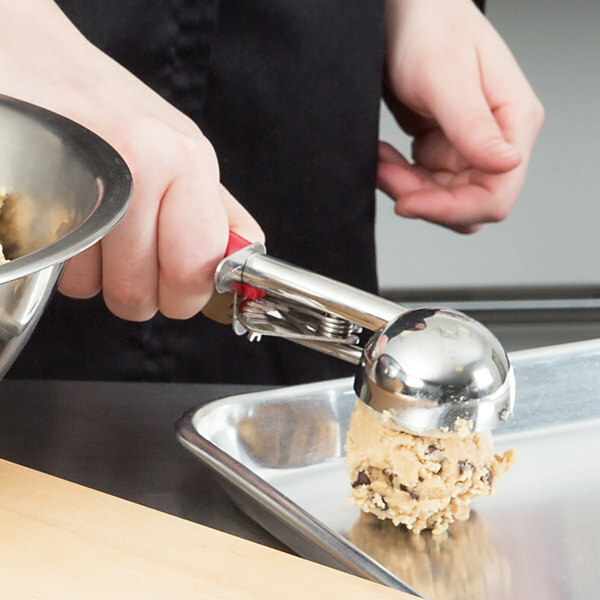 I use this one mostly for scooping cookie dough. I use these dishers for specific cookie projects. So far, there has been no rust or breakage. I also get a perfect form with each portion. 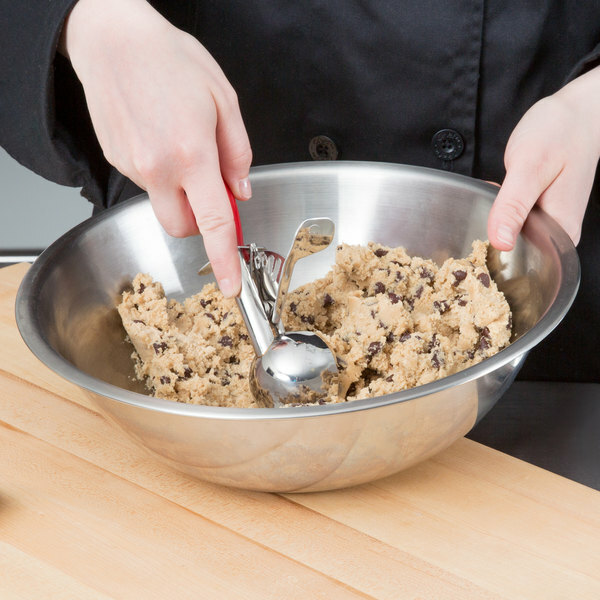 This allows me to maintain perfect consistency with my cookies. Another great product. We find more uses for these dishers every day. Purchased them for the business, but plan to get another set for home. At this price, I can't go wrong. Very high quality disher! The materials are thick and sturdy. We've run this items many times through our dish washer and it has not rusted or broke. I would highly recommend this tool. We use these accurate dishers for our cubed tuna, cubed salmon, octopus, and avocado. The color coded handles makes life very easy so we know which one gives the right amount. 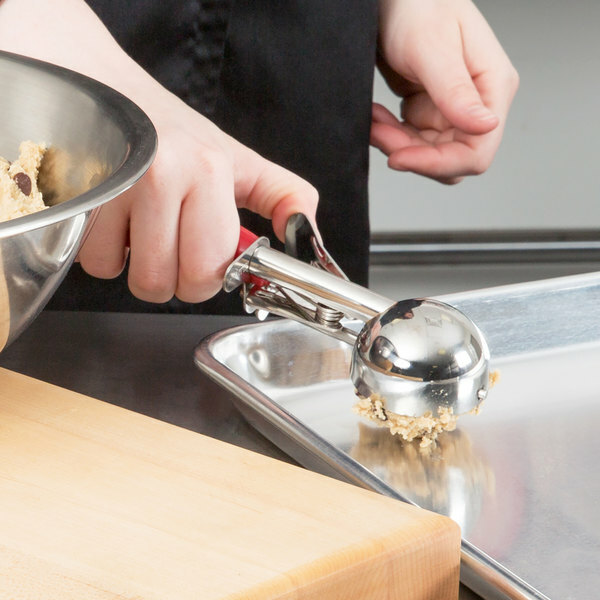 This is a nice large cookie scoop. I also use this to fill my cupcake liners and it puts in the perfect amount without overflowing. It’s also easy to clean. 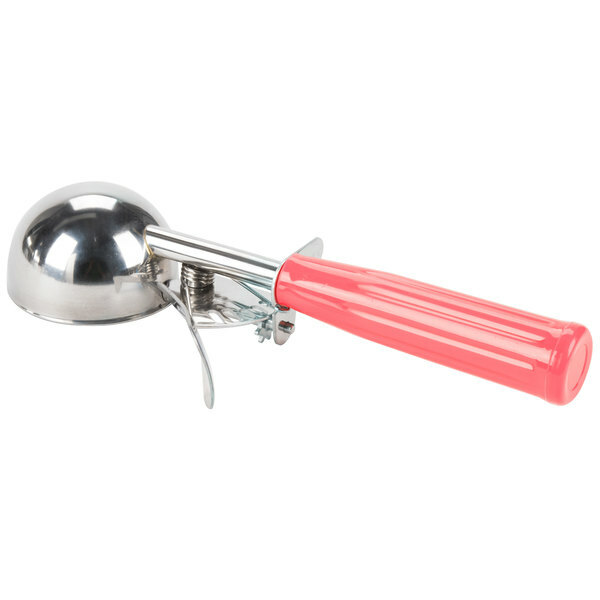 Excellent italian ice scooper at a phenomenal price. I love this company and they are by far the cheapest anywhere. I love all there products. 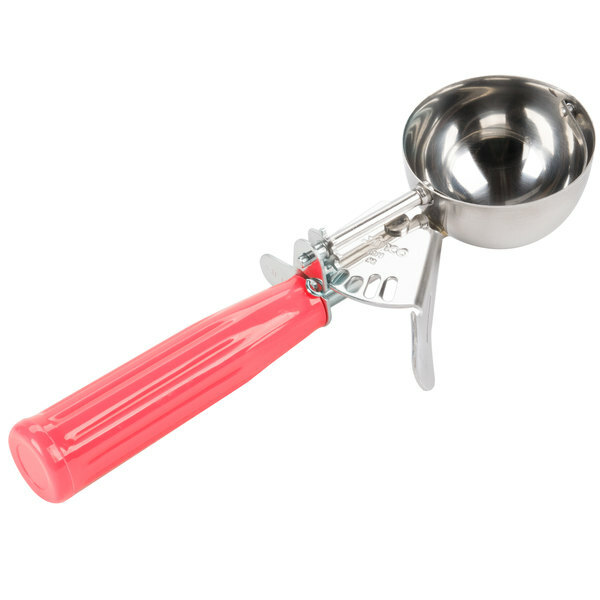 Perfect size ice cream scooper for when clients want ice cream but not a lot. brings out just the right amount of ice cream needed. I have also purchased other sizes of these this dishers and they all work easliy. 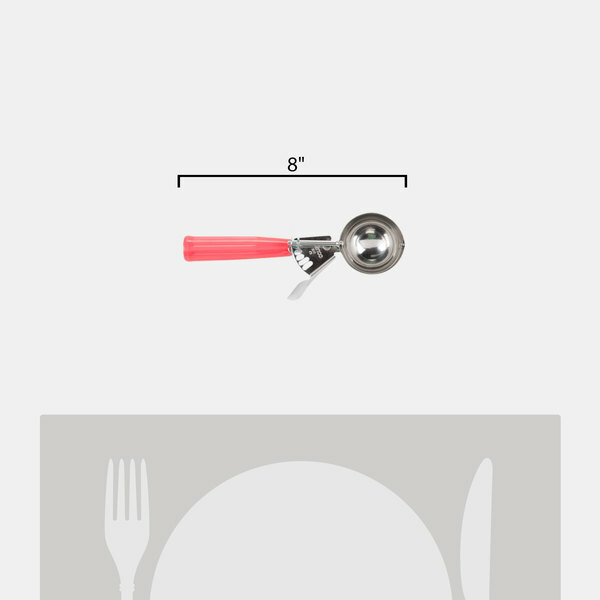 I use this size in particular to make my cake pops. They come out uniform in size. Love these dishers and really, really like that they're color-coded. It makes it so easy to find the one you need. I think they're really good quality and comforable enough for heavy use. 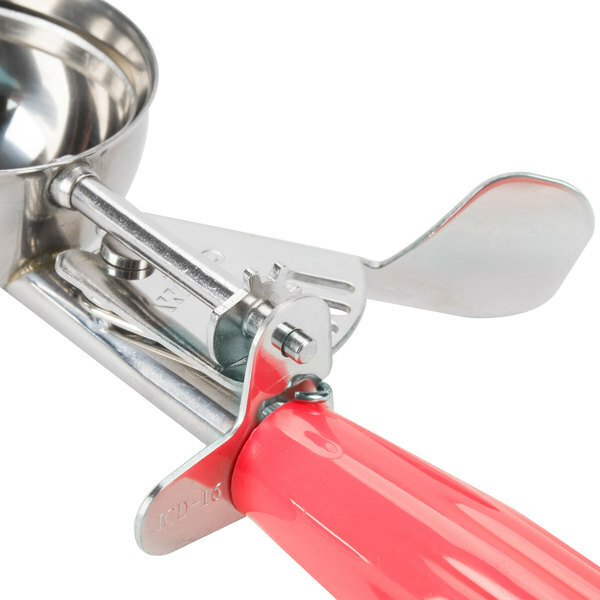 Great for portioning meatballs, cookies, batter, etc. Maybe not the best for very thick, hard foods. We use this product regularly in our in store bakery to ensure uniform product quality at all times. The product is well made and wears well with repeated heavy use. Great, high quality scoop. I use it to measure my cookies for my company and they always are the same size. This one makes around 3” cookies, weighing around 50g each. These #24 dishers are a perfect size for whoopie pies. We used them to scoop out over 1000 pies for a fundraiser- dishers are sturdy and well made. 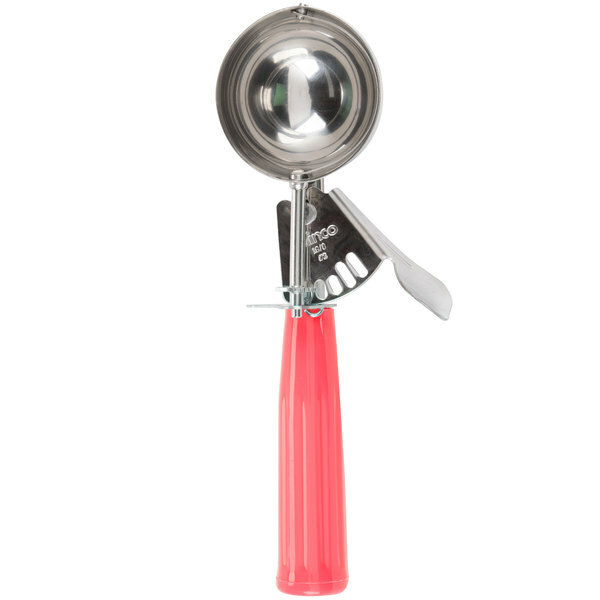 A great multi-purpose disher. We use this for most of our cookies, and it holds up well over really heavy use. It washes easily, and lasts us a long time. This is a true multi use tool in the kitchen. 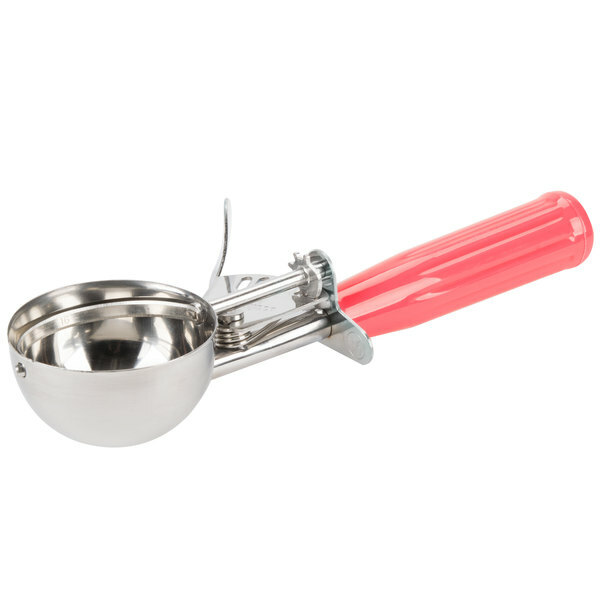 It can be used for portioning meatballs, sauces, sour cream, etc. We’ve used them for years and they always work great. I make different size meatballs for different functions. 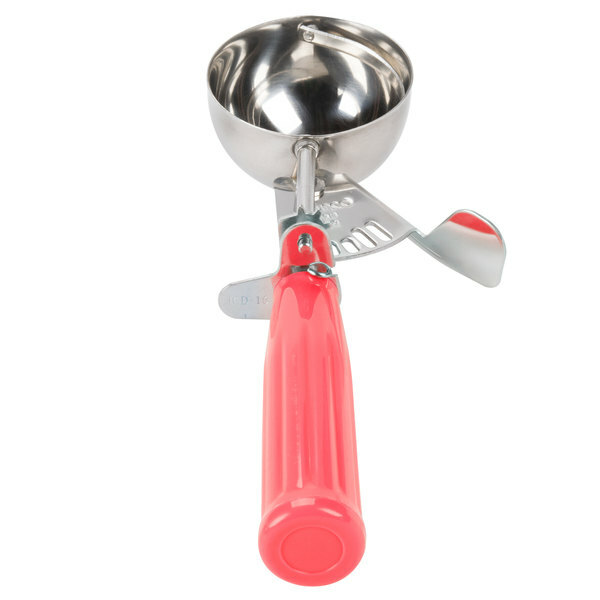 The 1.33oz disher/scooper is good for smaller/medium meatball for family style self serve events. The color handles also help me know which size I'm looking for real quick. Only complaint is they do hold some water in the handle. Other than they they are wonderful for scooping out my larger cookies, they handle the firmer dough great! (Not rock hard dough). Red meets my needs, I haven't had to replace them yet and it's been almost 2 years.